For many years, health experts issued guidelines that warned the public to limit egg consumption because of the high amount of dietary cholesterol in the yolks. Research has shown that it may be OK for many people to regularly enjoy eggs, including the yolks, however, so it isn't always easy to figure out how many eggs it is safe to consume on a daily basis. The overall composition of your diet may be more important than how many eggs you eat when determining your risk for disease. Each large egg has about 186 milligrams of cholesterol. It was recommended that people limit their cholesterol consumption to no more than 300 milligrams each day for a long time, but the Scientific Report of the 2015 Dietary Guidelines Advisory Committee no longer makes this recommendation. In fact, the committee notes that dietary cholesterol isn't a nutrient at risk of over-consumption. In healthy people, eating as much as one egg per day doesn't increase the risk of heart disease or stroke, according to a review article published in the British Medical Journal in 2013. People with diabetes, however, may experience an increased risk at this consumption level. A study published in The American Journal of Clinical Nutrition in 2015 had slightly different results, showing no increased risk of stroke or heart attack when at least one egg a day was eaten, but showing an increased risk for heart failure in men -- but not women -- at this rate of consumption. Research results regarding egg consumption and diabetes risk are conflicting. Although a meta-analysis published in The American Journal of Clinical Nutrition in 2013 found that eating eggs didn't increase the risk for heart disease in healthy people, it did find a potential increased risk for Type 2 diabetes for those who ate at least one egg per day. Another analysis, published in Diabetes Care in 2009, found a slightly increased risk for diabetes even at lower levels of consumption than one egg per day, in both men and women. On the other hand, a systematic review published in Diabetes, Metabolic Syndrome and Obesity: Targets and Therapy in 2014 reported that some types of diets that include eggs could lower the risk for both metabolic syndrome and Type 2 diabetes. While a study published in The American Journal of Clinical Nutrition published in 2008 found that egg consumption wasn't associated with the risk of heart disease, it did find that people who ate seven or more eggs had a slightly higher mortality risk. In diabetics, this risk of mortality was twice as high in those who ate seven or more eggs per week as compared to those who ate less than one egg per week. A study published in Metabolism in 2013 noted that people with metabolic syndrome showed improvements to their cholesterol levels and experienced less insulin resistance when they ate a whole egg each day as part of a diet that contained no more than 30 percent of energy from carbohydrates. Another study, published in The British Journal of Nutrition in 2011, found that people with Type 2 diabetes that ate two eggs per day had greater improvements in cholesterol than people who ate 3.5 ounces of lean protein instead of eggs and also improved blood pressure and blood sugar control and lost weight. Both groups followed a reduced calorie diet, getting 40 percent of calories from carbohydrates and 30 percent of calories from each protein and fat. These results seem to back up the recommendation of a review article published in Nutrients in 2015, which noted that egg consumption can't be taken into consideration alone -- it is the entire diet that needs to be taken into account. Choosing free-range eggs is best when you have the option, as these eggs tend to be more nutritious. According to an article published in Mother Earth News in 2007, these eggs are lower in saturated fat and cholesterol than regular eggs as well as providing more of the essential nutrients, including beta carotene, omega-3 fats and vitamins A and E. Those who wish to eat more than one egg per day may want to use a mix of whole eggs and egg whites to lower any potential risks, as the cholesterol in the yolk is thought to be responsible for any increased health risks from eating eggs. Is It Healthy to Eat Two Eggs a Day? 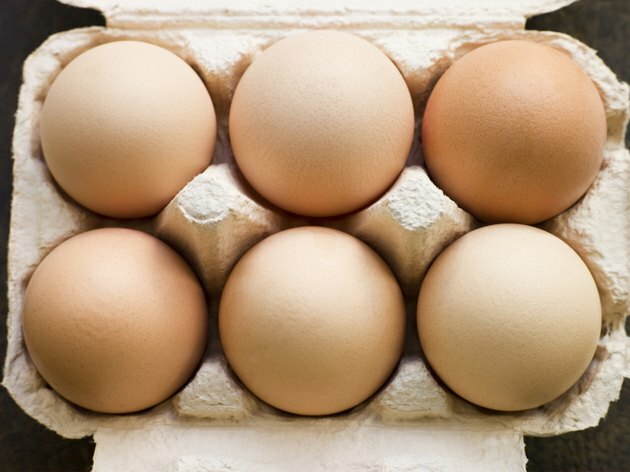 How Many Eggs Can You Eat Per Day on an Egg Diet?